Baler Moisture Meters are now available from Mr Nozzle . These are specially developed bale chamber sensors and they feature two stainless steel electrodes in a low profile design that's easy to fit and requires little maintenance. 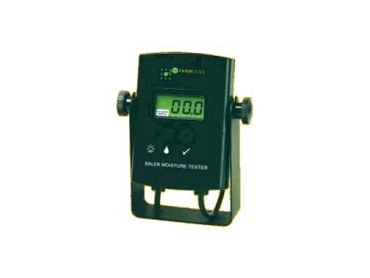 Baler Moisture Meters collect moisture readings and provide continuous average moisture percentage readouts. The values are updated every 2 seconds on a large user-friendly LCD display. These Baler Moisture Meters are fully illuminated so night work is not a problem. The units run on 12V power and they also include 7.5m sensor cables. Mr Nozzle also offers a number of alternative moisture meters, including digital hay testers and digital grain moisture meters. Experienced staff can help customers with all enquiries, assist in selection and troubleshoot any problems.